Analog #1 Review – AiPT! Analog brings forth an intriguing premise by breaking the internet and exploring the fallout. In the wake of the Cambridge Analytica scandal that has rocked Facebook as an organization and eroded the trust of many of its users, Gerry Duggan, David Sullivan and Jordie Bellaire launch their new Image series Analog. The series shows the state of the country and the world in an environment where a massive data breach has occurred and as a result, there is no longer any private information on the web. When we talked to Gerry in October of this past year, obviously well before the aforementioned Facebook issue, he mentioned that the idea came to him in 2015, and then was taken in a new direction after the election. The actual story is set in the year 2024, and the biggest plot point is that internet as we know it is broken. In 2020, an event known as “The Great Doxxing” ended up dumping all the secure and private information online as free and accessible to the public. In essence, nothing on the web and no activity on the web could be considered private anymore. Those who want to maintain privacy and some degree of secrecy have resorted to taking their secrets off-line, and when they want to transfer this information, they utilize Ledger Men like our protagonist Jack McGinnis. As we learn from the opening scenes of the comic book, Jack will protect the secrets he’s been hired to transfer by all means necessary. An entertaining firefight breaks out when a group of nefarious looking individuals call his bluff and try to relieve Jack of his briefcase that carries the secrets, and as Jack takes care of these threats and hands off the secrets to the intended party, he shows no interest in knowing what the secrets actually are despite his client’s willingness to share. As he makes his way to New York City the next day and shares the history and state of the world thanks to the Great Doxxing, we learn that this lack of interest is likely because literally anything that was once considered private is now out in the open. Pedophiles are openly exposed because of their browser history. Private message exchanges between two individuals are now openly visible to the entire public. Couples now livestream their intimate activities online in the open and in public in the open, as there is no need to have any sort of privacy. There are some people, including Jack, and some places, including a bar he frequents named “Courthouse,” that have responded to this turn of events by simply going off the grid. A memorable moment occurs when a patron with a wearable walks into Courthouse and is severely chastisted by the owner Vince who essentially lost his daughter to a bullying-induced suicide thanks to social media. We then learn through a flashback that Jack is not as much of a bystander as he appears to be and that the reason for his participation in the Great Doxxing likely was a reaction to a proposition made by a Mark Zuckerberg type of character. The issue closes with us learning about Jack’s relationship with his father and with what appears to be impending payback from the organization that tried to accost Jack at the beginning of the issue. Duggan writes Jack as one of those classic rough-around-the-edges good guys who has seen it all and done it all. One of the comparisons I kept making in my head was Reese from the TV show Person of Interest, which features a similar story about a grizzled protagonist who learns about a betrayal and then flips the script and ends up becoming a vigilante on his own. I liked the fact that so far, Duggan doesn’t tell us everything and leaves some things to the imagination (or to future issues). We see Jack already scuffed up as the gang approaches him at the beginning. We see Oona, who is likely Jack’s girlfriend, partner or significant other, only for the briefest of moments and with her face heavily concealed. When Jack says “we” destroyed the web, we see what motivated him to become a part of the Great Doxxing, but we don’t actually see the act itself. This approach is fun and leaves you wanting more, in a good way. On the flip side, there were a lot of panels and explanation dedicated to telling the history of the world. It’s not a major knock at this point, but continued flashbacks and exposition in future issues may take away anticipation and excitement. Also, the “bad guys” of the story and the clients that hire Jack came across as pretty generic — while they give him jobs or try to get rid of him, perhaps shedding light on what exactly the secrets are might raise the stakes and deepen the reader’s interest. Sullivan and Bellaire show they don’t need to rely on flashy splash pages to make an impact. While there is a fight at the beginning, it’s not overly gratuitous and the art serves the plot. The lines are crisp and the characters are able to show off a wide range of emotions and expressions. The most memorable page for me was where Jack is taking a walk through New York City and you see some of the fallout of how society acts now in light of the Great Doxxing. The colors were used quite well and the “lighting” of each scene reflected the tone of the story with a somber tinge permeating every surrounding. Even the sunlight seems somewhat uncomfortable and foreboding as Jack is walking out in the open. While it was great to learn about the history of Jack and this world in this issue, I look forward to learning more in the next issue about the specifics of the secrets he’s smuggling and the villains chasing after him. Also, given that Duggan seems to have predicted to some degree what is currently going on with Facebook in real life, it will be interesting to see if he has the opportunity to incorporate that into future storylines. 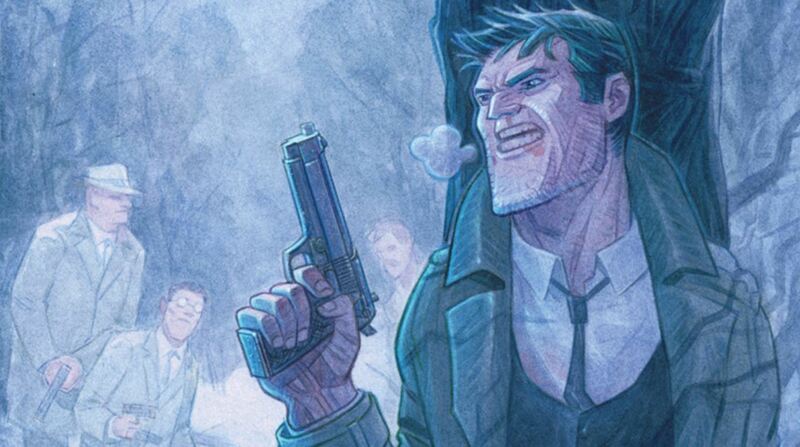 Overall, Analog brings forth an intriguing premise and is off to a great start. The art is strong and reflects the mood of the story without being flashy or gratuitous. Duggan doesn't tell us everything and leaves some things to the imagination (or to future issues). The "bad guys" of the story and the clients that hire Jack came across as pretty generic.